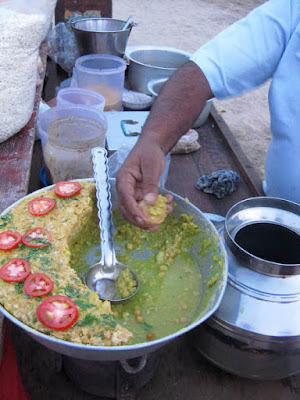 Who doesn't love Indian street food? Bhel puri, sev puri, aloo tikki, paapdi chaat, pav bhaji, chhole bhatoore... you get all these at small thelas along the streets of India. You even get Chinese veg. noodles and momos these days! One-by-one, the prepared bataashe go into such foil or pattal donas that all the ladies are handed as soon as they place their order. We (i.e. 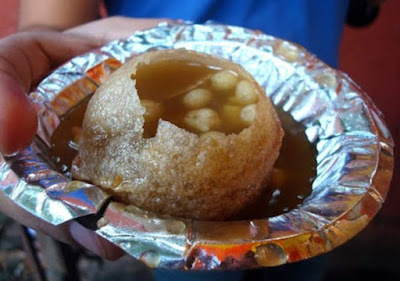 the ladies) then pick up the entire gol gappa and stuff it into our mouth, relishing the crunchy, spicy, tangy flavor! Ohhhh! Just thinking about it is making my mouth water! I have actually bunked coaching classes to go and have pani puri with my friends! Seriously! I don't think there's anything else in the world that can help you achieve that level of pure ecstasy! Every nerve, every fiber of your body comes alive! Mmmmmm! Do you like street food? What's your favorite? Please DO join in this month-long marathon of sharing about ourselves. If not on your blogs, join in the comments below each post, here or on Facebook! This is my 20th post for KBL Jun 2015: My Favorites. Link to the previous post: My Favorite Family Photo. Oh! So you like Indian food, Elly? Wow, Rachna! You make it at home? I wish you were my neighbor! :P Hehe! How is it at Kanha's? Parul, my Dad has a theory about females going for pani puri so much. He says it's got to do something with the khatti chutneys and the fact that the female body needs more vitamin C. I don't know how accurate his theory is.